An investigation has begun into the cause of a fire on board a nuclear submarine at a shipyard in Cumbria. The blaze broke out on the top of the conning tower on Astute, which is currently awaiting sea trials at the BAE shipyard in Barrow. BAE said the fire was limited to rubber tiles on the outside of the structure and its nuclear reactor was unaffected. It is believed to have started while a pipe that feeds air to a diesel engine was being tested on Saturday. 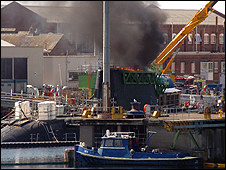 BAE said in a statement: "During trials of the snort induction mast on board the first of class Astute submarine, moored at the Devonshire Dock quay at the BAE Systems shipyard in Barrow, a fire broke out which was limited to the exterior of the submarine. "In accordance with standard safety procedures, the submarine and Devonshire Dock Complex were evacuated and Cumbria Fire Service attended. There were no casualties. "An investigation has begun to determine the cause of the fire. "Initial investigations indicate that damage was limited to the external areas of the submarine at the top of the bridge fin. "However, a full damage assessment is now under way and recovery actions are being undertaken jointly by BAE Systems and supply chain partners in order to minimise the impact on the Astute programme."